Tomb Raider's Publisher Wants You to Shoot Arrows At New York Comic-Con. What Could Go Wrong? 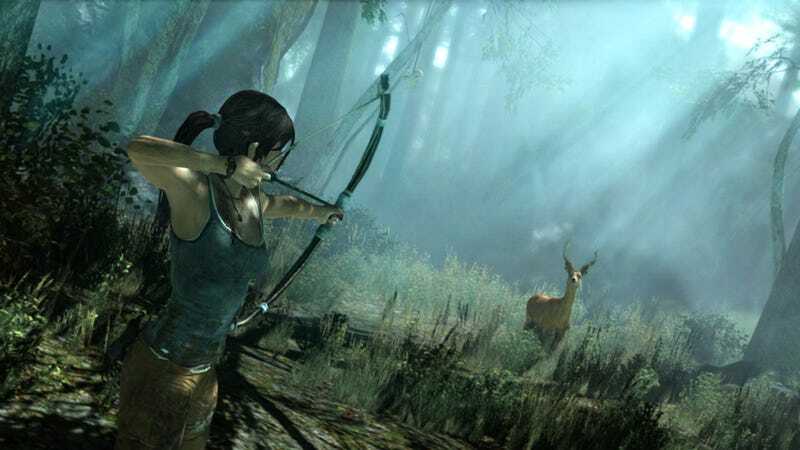 In addition to being able to get hands-on time with the game, New York Comic Con attendees will have the opportunity to test their archery skills at the TOMB RAIDER Archery Experience. Each participant will let three arrows fly at their own individual TOMB RAIDER themed shooting target which they can then take as a memory of the event. Those lucky archers who hit a bull-eye will receive a limited edition TOMB RAIDER lithograph. The Archery Experience is being supervised by the New Jersey School of Archery. See, I'm thinking that if these were Nerf arrows, no supervision would be necessary. Sure sounds like live fire to me. But I'm guessing that most arrows won't even reach the target, much less nail it dead center. If you're not into real-life archery, Square Enix will also have playable demos of Tomb Raider and Hitman: Absolution at NYCC, as well as announcement of upcoming DLC plans for Sleeping Dogs. And, if any of y'all go and get a bull's-eye, let your friends at Kotaku know, mkay?